Johnnie To’s project, of having three directors emerging from his Fresh Wave program (Frank Hui, Jevons Au and Vicky Wong) directing three different segments, each dedicated to one of the actual, most notorious kingpins of the 90’s (Kwai Ping-hung Yip Kai Foon and Cheung Tze-keung) and then welding the three together, was one of his greatest success of the latest years, with “Trivisa” earning a number of awards from festivals in the Sinophone world. The story unfolds in early 1997, just before the transfer of sovereignty of Hong Kong to China. The three aforementioned kingpins have fallen to hard times, for the most part. Yip Kwok-foon, a bit time robber, is on the hiding after a gunfight with the Royal Hong Kong Police, instead dealing with the smuggling of counterfeit electronics. He makes a lot of money but is highly unsatisfied due to the lack of thrill, but also because he has to kowtow to Chinese Officials. Kwai Ching-hung is a robber, who continues to deal with minor heists, with little risk but little profit. As the film starts, he visits an old time collaborator who has now retired and has a family. The latter is happy to see his old “comrade” but soon realizes that he is being exploited. Cheuk Tze-keung is as flashy as possible, and deals with big-time kidnappings, being rather successful, despite the constant police surveillance. Everything changes for the three, when a rumor that the “Three Kings of Thieves” are preparing a common heist starts circulating, unbeknownst to them. Cheuk is excited and wants to pursue it, Kwai decides to disregard it and continues to lay low until he starts having second thoughts. Yip feels the need to pick up his gun again and join the others. All three segments deal with the central concept of “the day after” for criminals; their decision, in essence, of continuing to be outlaws or turn to something else. The answer becomes evident in all three parts, as every director seems to show that “one cannot change his nature”, although with a different kind of approach. In that fashion, and while all three characters seem to suffer from some kind of depression, their reactions are quite different. Yip cannot contain his frustration, Kwai becomes even more introverted, and Cheuk acts out, both in appearance and behaviour. And while the first two arcs work quite well, I felt that the third one, which leans toward the comedic, actually strips some of the essence the movie emits, as all three parts transform into thrillers as the film progresses. In that regards, the combination of drama and thriller works quite well for the first two, but the one with comedy and thriller not so much for the third one. The overall impression the film leaves, however, is quite good, and this accomplishment owes much to the exceptional job Allen Leung and David Richardson did in the editing department, connecting the three different works in a way that results in a compact movie, just with a few extra scenes here and there. Kudos are also owed to Johnnie To for making the whole concept come through in a logical and quite captivating fashion. Zhang Ying, Ray Cheung and Rex Chan’s cinematography follows the same general rules, with the film looking like a noir for the most part, since the night scenes are the ones that dominate the narrative. Again, the part featuring Cheuk follows another direction, with the cinematography and the coloring matching the flashy protagonist, but in the end, the noir element takes over in this also. The acting is on a very high level, with every actor depicting a rather different persona in the most convincing way. 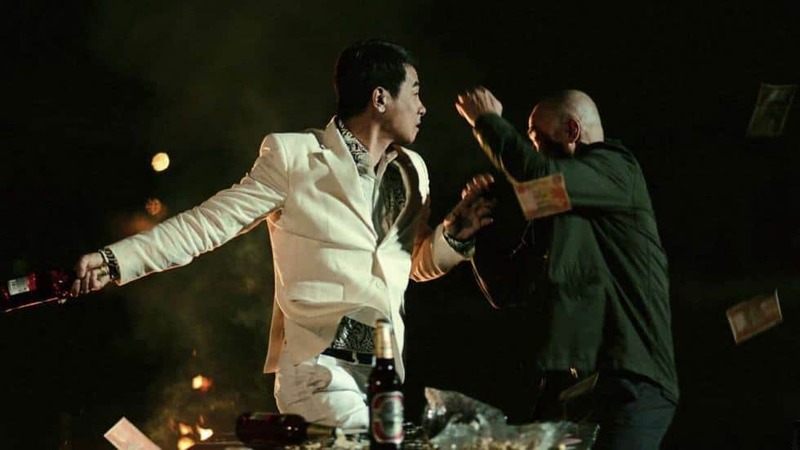 In that fashion, Jordan Chan as the “clown”, Lam Ka-tung as the introverted “exploiter”, and Richie Chen as the fed up “bruiser” are quite convincing in their respective parts, actually anchoring the film with their performances. 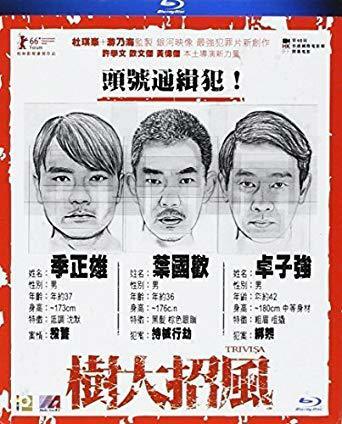 “Trivisa” may have some faults, particularly regarding the difficulty of welding three different narratives together, but the end result is great, both as an exercise into something completely original and as a full film, in the distinct style of the HK crime thriller. Interview with Jevons Au: I cannot say if the black list really exists but the White Terror and the self-censorship definitely exist.